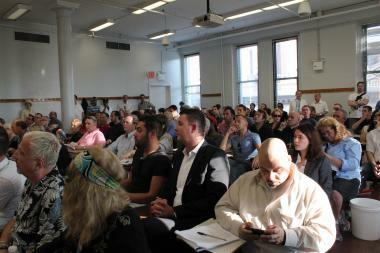 The crowd at Community Board 2's SLA subcommittee meeting last Thursday night. GREENWICH VILLAGE — A longtime gay bar hoping to relocate to West Eighth Street had its bid for a liquor license shot down by the community board last week, as residents feared its arrival could turn the area into more of a nightlife destination. Community Board 2's SLA subcommittee voted to deny a liquor license to Pieces in its attempt to move from its current Christopher Street location to 61 W. Eighth St. last Thursday. Opponents say the once-vacant street has filled with too many bars, making it a potential magnet for revelers. But supporters argued Pieces attracts a local and well-behaved clientele, and would be a boon to the street as it continues its renaissance. The subcommittee's vote will go before the full board for final a decision on Thursday. The window of Pieces at its current location on Christopher Street. There are currently 15 active liquor licenses within 500 feet of the proposed new location, requiring the establishment to prove some public benefit before being approved. The bar’s owner, Eric Einstein, said he gathered more than 4,000 signatures supporting the relocation. 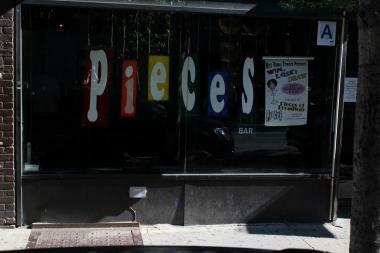 Pieces opened at its current Christopher Street location in 1993, but could not resign its lease there because the landlord was rehabilitating the building, he said. Einstein said he promised during previous negotiations with the West Eighth Street Block Association that the proposed venue would be professionally soundproofed. But residents spoke out about the effects of all the bars on the area, including Sharon Woolums, a West Eighth Street resident of 40 years. What was once a hot stretch of commercial real estate for the neighborhood, West Eighth Street between Fifth and Sixth avenues has seen a steady decline in recent years, leading to high retail vacancies. Some residents, like Woolums, told the subcommittee they did not want empty stores to be taken over by bars that would draw patrons from all over the city. The owner of the bar and its supporters, which included many local residents, argued Pieces was more a bar for the local LGBT community. For other customers, like 40-year-old local resident Michael Borowski, they feared losing a neighborhood hub where they felt comfortable. “We are losing gay nightlife to uptown — Chelsea and Hell’s Kitchen,” he told the subcommittee. 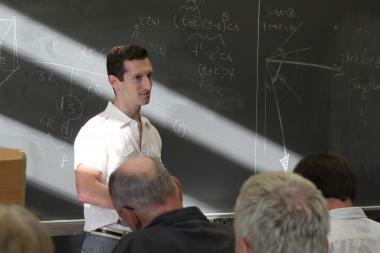 Eric Einstein addresses the subcommittee and the audience who attended last Thursday SLA subcommittee meeting. The West Eighth Street Block Association also asked the bar to accept closing times of 11 p.m. from Sunday through Thursday and 2 a.m on weekends, said member Gil Horowitz, who has lived on the street for 44 years and was present at the meeting Thursday. But Einstein said the proposed hours would severely limit his business. “It can’t be 11 p.m." he said. "It’s not viable business." Still, Einstein told DNAinfo he is optimistic a middle ground can be found between the block association and his application for a 2 a.m close during the week and a 4 a.m close on Friday and Saturday nights. Einstein is hopeful Community Board 2 will ultimately ignore the subcommittee's recommendation and approve the application this week. While not binding, the board's decision is weighed heavily by the State Liquor Authority in its decision whether or not to grant the license. Community Board 2 will meet at 6 p.m. on Thurs., July 21, at SEIU Local 32BJ, 101 Avenue of the Americas, 22nd floor.